SAY ta-ta to the Tiida. And welcome back Pulsar. Nissan is throwing a party for the Pulsar's return for good reason. The full-line importer believes its comeback will quadruple sales of the outgoing Tiida models - even though prices start $1000 higher. The Pulsar has been missing from Nissan showroom for seven years by research shows it's still more widely known than the model it replaces. Even the marketing is winding back the clock. The Pulsar still starts from $19,990, as it did back in 1996 (with free air). For now only the sedan is available, but a hatch variant will be on sale by June - including the much loved SSS variant. Nissan says it has delivered a good value proposition, focusing on value for money and cabin practicality. 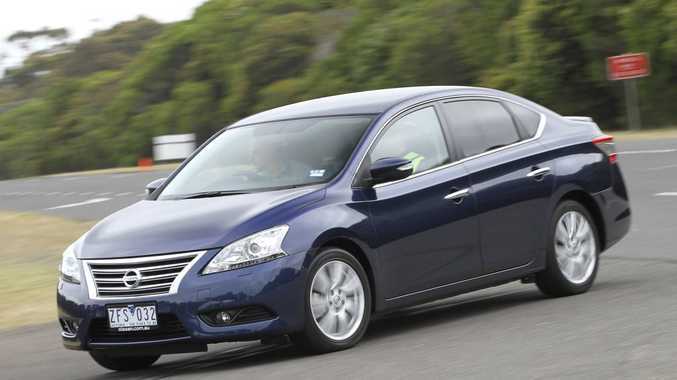 "For decades, the Nissan Pulsar was the Small car in Australia," said Nissan Australia's managing director and CEO, William F Peffer Jr.
"We've made the right decision to re-enter the Australian small car segment with the name-plate that for so long characterised Australia's compact car landscape." We sampled the Thailand-built Pulsar range during a brief drive outside Melbourne today, and first impressions are positive. The sedan is well appointed with a refined cabin feel. Comfortable and quiet on the road, drivers with find either transmission adequate for varying conditions. The writer was Nissan's guest in Melbourne. Details: Four-door front-wheel drive small sedan. Engine: 1.8-litre in-line four-cylinder petrol generating maximum power of 96kW@6000rpm and peak torque of 174Nm @ 4800rpm. Transmission: Six-speed manual or continuously variable automatic. Consumption: 7.2 litres/100km (m); 6.7L/100km (a). CO2: 169g/km (m); 160g/km (a). Bottom line: ST $19,990 (m), ST $22,240 (a), ST-L $23,650 (m), ST-L $25,900 (a), Ti $28,990 (a). Plus on-roads. • 1978 Nissan launches Pulsar, as a replacement for the Cherry. It is the first mainstream Japanese front-wheel drive small car in Australia. • 1982 Nissan Australia starts local manufacture of second-generation Pulsar with tuning to suit local roads. • 1984 Nissan Australia uses local expertise of its race team to develop a Pulsar version of the turbocharged EXA Coupe. The Pulsar ET with its 4-wheel disc brakes, sports-tuned suspension and EXA turbocharged engine. • 1985 One-make Pulsar ET race held at Mount Panorama as a support race to the Bathurst 1000. The Pulsars lap in the same time as the first 4.7-litre V8 Falcon GTs. • 1987 Nissan Australia launches third generation Pulsar with some models powered by a 1.8-litre engine developing 79kW engine. • 1991 Nissan Australia launches fourth generation Pulsar spearheaded by sporty SSS version with a 2.0-litre engine developing 105kW. The SSS is popular with racing drivers and fares well in the 1992 James Hardie 12-Hour race for production cars. • 1995 Nissan Australia launches fifth generation Pulsar with unique hatch/wagon bodywork. • 2001 Nissan Australia launches sixth-generation Pulsar with 1.8-litre engine on some variants.